Although not an entirely new concept, chalkboard paint has been around for several years and a popular item in home decorating. In the past few years, it has also been easing its way into the entertaining world as well. People are finding more and more ways to use chalkboard paint. Here are our 5 favorites! 1. A Menu Board. 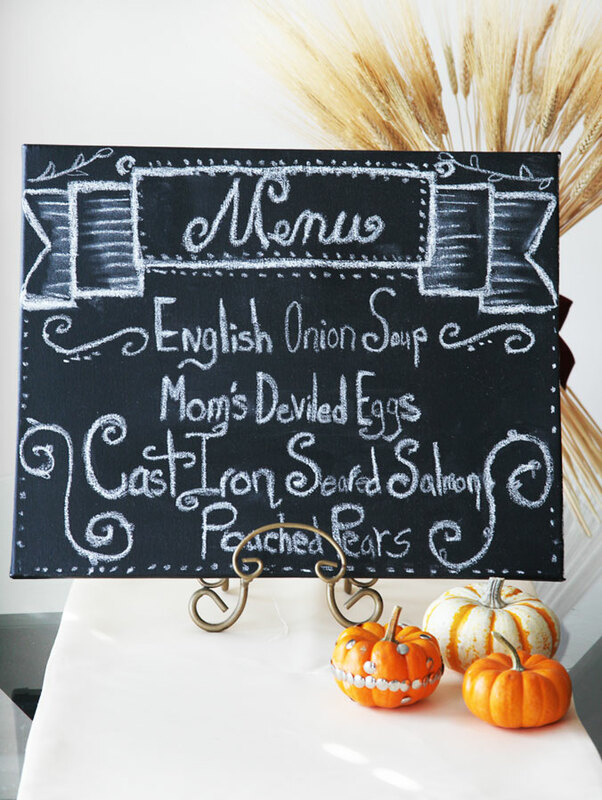 Use chalkboard paint to create a fun menu board which you can also use as a message board, when you are “between” parties. Simply purchase an artist’s canvas and a small bottle of chalkboard paint… remember, a little goes a long way. With a wide brush, paint the canvas with horizontal strokes and wait one hour for the canvas to dry. Then, paint the canvas with vertical strokes and wait one hour to dry. You can repeat these steps one more time, making sure the canvas is completely covered in paint. Here’s the IMPORTANT part! Make sure you give the paint 24 hours to “cure”. Once the 24 hours is up, your will have a beautiful canvas which you can use for a menu board or a message board. You can even frame it with a beautiful whimsical frame, for an extra special touch. 2. Buffet Runner. Using a painter’s canvas, you can cut a sheet of fabric to the size of your buffet area. Paint it with chalkboard paint and let it “cure” for 24 hours. Then, lay it out on your buffet. Arrange your food platters on top and write with chalk what the food items are…directly on your new buffet runner. Great way to let your guests know that the Salmon they are eating is actually “Grandma’s secret recipe Lemon Salmon”. 2. Customizing Glasses For Guests. 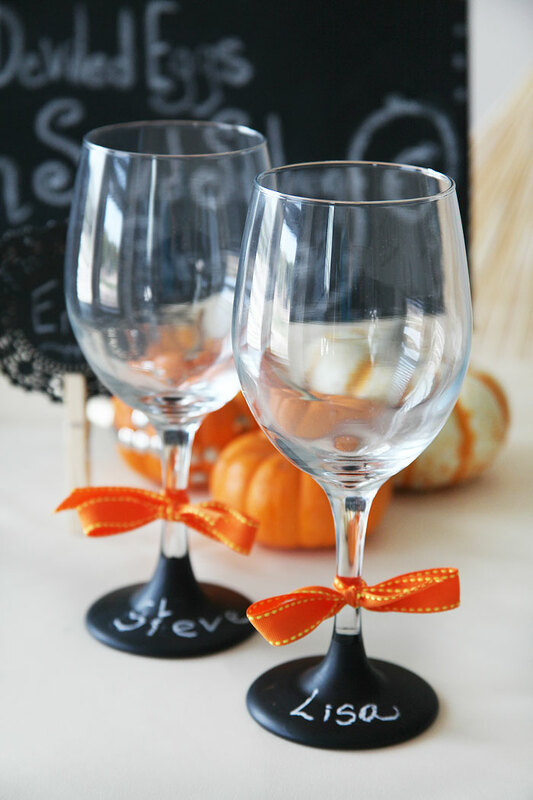 If you tend to forget which glass is yours or even what charm you chose for your wine glass, you’ll love the idea of painting chalkboard paint on the base of your water or wine glasses. Let guests write their names or draw pictures on their glass and they’re sure to be able to remember which one is theirs… no matter how many glasses of wine they had that evening! 4. Paint rocks with chalkboard paint and use them as place settings. This project is easy and can even be done by your kids. Just paint medium size river rocks with chalkboard paint and use them as place settings. Very rustic and fun! 5. Paint Doilies and use them as place settings or signs to identify your buffet items. Another project you just can’t go wrong doing. 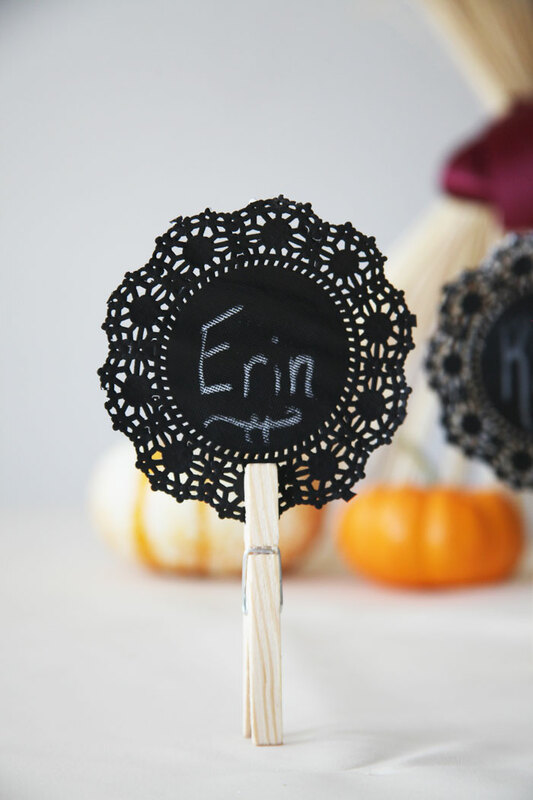 Purchase doilies at your local supermarket and paint them with chalkboard paint. Use them as place settings or display them on the buffet identifying all your delicious creations.